In the last few weeks, I’ve vaguely referred to whale oil and the profits made through a successful 19th Century whaling voyage. Now it’s time to get a little more specific. After-all, a two year voyage, all that hard work of whale hunting, and the trip home should have been worth something. It was. In fact, the industry was so profitable that the hunting continued endlessly, in an attempt to supply the market with the raw materials. Today, we’re going to talk a little about the numbers and monetary value of the whaling industry. It’s not an attempt to justify over-hunting or glorify the pain and suffering; rather, it’s an attempt to understand why this was acceptable in the past. First thing first – let’s be clear about whale oil and where it came from. The most prized whales (typically sperm whales) had “reservoirs” of fatty oil in their heads; this was called spermaceti and was the most valuable oil in the whale’s carcass. The whalers thought of this pure oil as “liquid gold” and it would get the highest price on the market since it burned exceptionally clean and well. Then there was the second quality oil, obtained by “cooking” blubber. On a healthy, average sperm whale, blubber could be 18 inches thick! All whales – toothed and baleen species – have blubber, so even if the whalers didn’t hunt the sperm whale, then still had potential profit for every whale they killed. Using specially sharpened tools and utilizing winches and pulleys to turn the whale in the water and lift the blubber, the whalers literally stripped away the blubber in huge chunks. 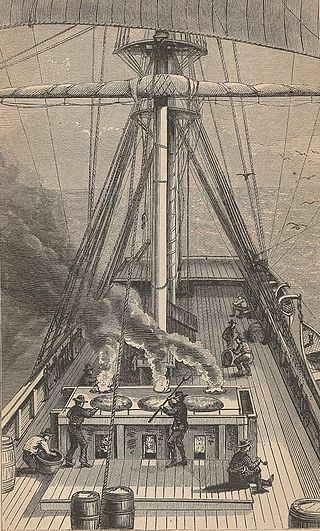 Aboard ship, the men chopped the blubber into small pieces and put it into the boiling pots to melt and refine the fat into oil. All oils were stored in barrels in the hold. Whales were rated based on how many barrels of oil they would bring. 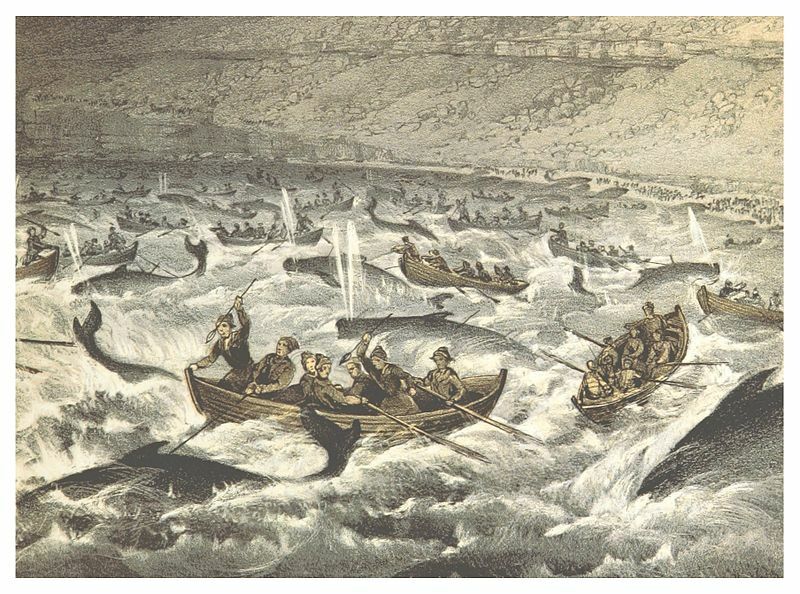 A whaler might say, “he’s a forty-barrel.” Meaning they estimated the whale would fill forty barrels with oil. Whale oil wasn’t the only lamp fuel on the market, but it was the most expensive. (At least in the lists I’ve seen.) Selling at $1.30 to $2.50 per gallon, depending on the quality, whale oil was valuable for its cleaner burning, but likely only the rich could actually afford it. 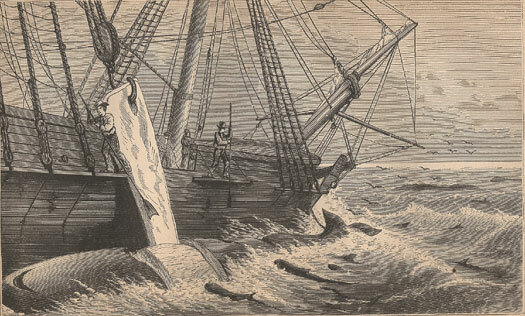 In 1853, an estimated 6 million gallons of whale oil reached American shores. One list of returning whale ships in New England records 252 vessels returning to port in 1853. Of course, everything wouldn’t have been divided perfectly, but just for the sake of perspective we’ll divide the market profit by the number of ships. That’s $47,619.05 per ship. Obviously, the captains and crew didn’t make quite that much (see final paragraph), but this helps to loosely put the whaling industry into perspective. Oh, and this is an era before the inflation that we experience in the 21st Century. 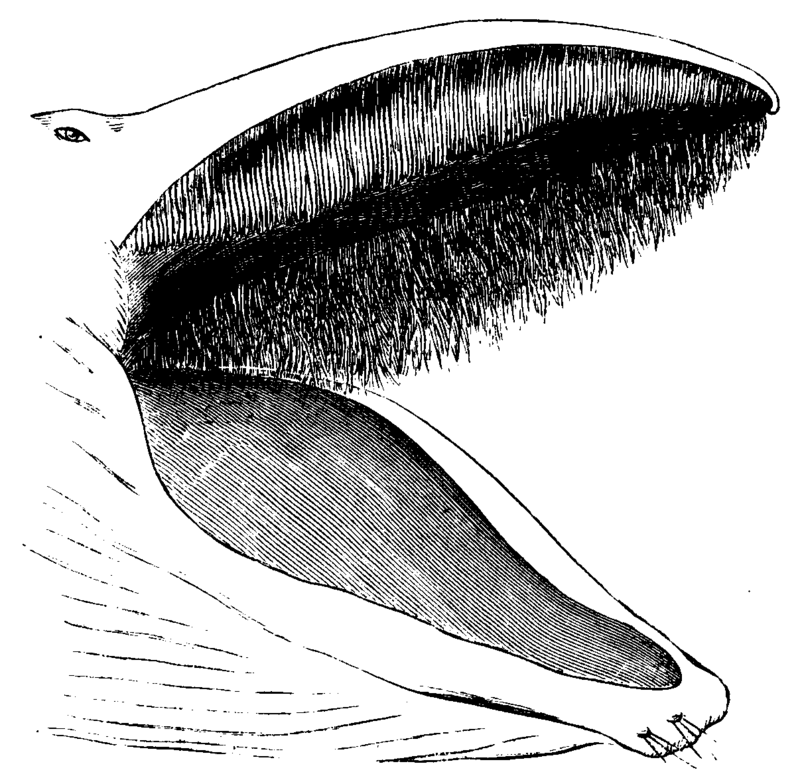 Sketch showing baleen in the top of the whale’s mouth. What is it? Good question. There are basically two types of whales: toothed and baleen. Toothed whales have teeth (orcas, sperm whales, etc.). Baleen whales have cartilage in their mouths to filter little krill and fish out of the water (humpback, gray whales, etc.) That filter system in their mouth is called “baleen.” It’s flexible, but really strong. Hunted baleen whales were stripped of their blubber for whale oil, and the baleen was also cut from their mouths with a specially designed cutting device, cleaned, prepared, sorted and stored away in barrels to be sold to factories. One ship in 1853 sent home 15,500 pounds of bone according to Alexander Starbuck’s list. Okay. What did they really use baleen for? First, fashion – corsets, stiffeners for hoops, bodices, and other garments. Second – bristles for brushes. And then there were other uses, including ribs for umbrellas, buggy whips, carriage springs, and fishing poles. 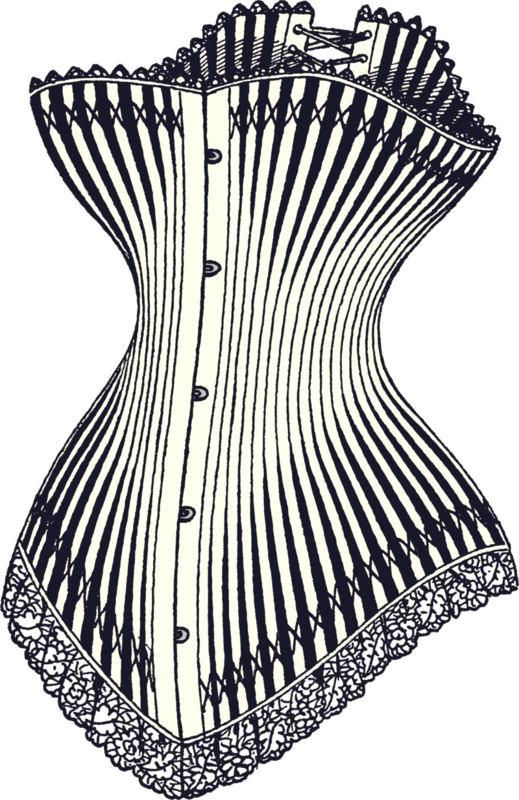 Whalebone was used in corsets. Was it profitable? Again, yes. According to one source, by the late 1870’s, baleen from a single, large baleen whale could be worth $50,000 and sometimes sold for $3.00 per pound. In some ways, the market need for baleen kept the whaling industry alive once the need for whale oil died off around the 1860’s. A couple years earlier (1836), another ship returning from a very successful voyage split its leftover profit among captain and crew members this way: Captain $5,882 – First mate $4,545 – Harpooneers $1,333 – Blacksmith $714 – Seamen $800-$571. Was it worth it? With an exceptionally good voyage, a whaler could make more than a landsman. But how many exceptionally good, quick voyages were there? Working conditions were a lot worse than many situations on land. The men were away from their families for years. And they were hunting huge, fighting animals. Was it worth it? It’s all in your perspective, I suppose. And I think the whalers of the 19th Century would’ve said the same thing.